If you’re a fan of horror films and haven’t seen any of the American Horror Story series then you really need to catch up! And if you’re a fan of the series, this set is a must-have! You Can Check In… But You Wont Check Out! 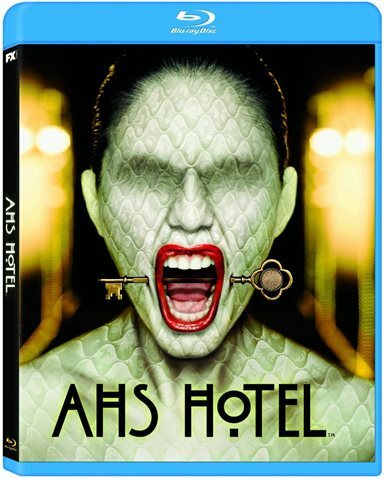 Last week, FX released the Blu-ray box set of American Horror Story: Hotel. Those who watch the series regularly know that each season starts with a new theme and generally uses the same cast for new characters in the new season. The big difference in Season Five is the loss of Jessica Lang, who was one of the main central characters throughout the first four seasons, along with Frances Conroy. In fact, many were quite concerned that without Lang the series may flop, but then they made an addition to the cast that no one expected… Lady Gaga. In fact, with the addition of Gaga and the Hotel theme, they took AHS to a bit more graphic place than in previous years. For those who haven't seen the series, or know not of which I speak, American Horror Story is pretty much just that. Each season is based on a particular theme and from start to finish the question is who will survive… if anyone! Season Five starts out with Detective John Lowe (Wes Bentley; Broken Vows), who's investigating a brutal murder. Lowe has had some tragedy in his own past. Estranged from his wife and daughter, you find that his son went missing years ago and the couple hasn't been the same since. While investigating this series of brutal murders, Lowe ends up moving out of his house and into the Hotel Cortez. The Hotel Cortez has a host of wild characters, but none more so than The Countess (Lady Gaga), a blood sucking vampire who looks at guests of the Cortez as her play things. Along with the Countess is the Front desk clerk, Iris (Kathy Bates; Misery), who stays because her son Donovan (a former drug addict & converted vampire boyfriend of The Countess, played by Matt Bomer) stayed at the hotel as well. Then there's Liz Taylor (Dennis O'Hare; Dallas Buyers Club ) a door-to-door salesman who stayed at the Hotel Cortez and found he could be himself there, under the liberating Countess. Then there's Sally McKenna, otherwise known as Hypodermic Sally (Played by Sarah Paulson), who's always there, lonely in the background, willing to help any man who's willing to give her attention. It turns out that Sally, along with many of the other guests in the hotel, died on its premises and they are now stuck there. That, in turn, leads me to James Patrick March (Evan Peters; X-Men), who was the previous owner and once husband to The Countess. He also died inside the walls of the Hotel Cortez and is a permanent fixture in the hotel he created. The thing is, Mr. March was also a serial killer who loved to cause pain and torture people. In fact, the hotel has secret passages and places where he could hide and toy with his victims and even has a chute to dispose of the bodies. I won't go into many of the details of each character's stories because there are so many with stories that weave in and out of each others lives, but, suffice it to say, there is a lot of anger and killing going on inside the Hotel Cortez. In fact, what's truly fascinating is the fact they based the Hotel Cortez off the Cecil Hotel in Los Angeles. Not many may have heard of it, unless you heard of the story of Elisa Lam, the Canadian student who was last seen acting erratically in an elevator, who's body was found inside of the water supply tanks on the roof when someone complained that the water was tasting "funny". Even more crazy is the fact that the Cecil Hotel was not only the home of Serial Killer Jack Unterweger, but also Richard Ramirez (The Night Stalker), who in American Horror Story: Hotel actually makes an appearance at a James Patrick March dinner party at the Hotel Cortez! The performances in American Horror Story: Hotel truly do shine. In fact, Lady Gaga won an Emmy for her performance as The Countess and Sarah Paulson was nominated for her role as Hypodermic Sally and won the Emmy for her role as Marcia Clark in The People v. O.J. Simpson: American Crime Story. Personally, I think she won for both, but they can't announce a tie with herself! While everyone will argue which season is their favorite, each season has its own flavors and, quite honestly, I had my reservations after hearing Jessica Lang wouldn't return for the fifth season. And, while I totally miss seeing her and Francis Conroy, new additions to this stellar cast are continually being added. Hotel seemed to really step it up a notch and made me want to watch it live each night it aired and if you go and get this blu-ray plan on binging the whole series in a weekend! This Blu-ray set has a couple of features that include An Invitation to Devil's Night and The Cortez: An Era of Elegance Gone By. They are both a bit on the short side; however, they compliment the package nicely. If you're a fan of horror films and haven't seen any of the American Horror Story series then you really need to catch up! And if you're a fan of the series, this set is a must-have! I give American Horror Story: Hotel (Season Five) four and a half stars out of five. It's impressive that a series can still be original and keep your attention without falling into the trap of flying on autopilot and AHS is one of my favorite Series out there! Keep up the killer series FX!! Download American Horror Story: Hotel from the iTunes Store in Digial HD. For more information about American Horror Story visit the FlickDirect Movie Database.